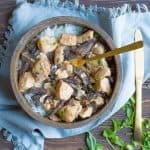 Set it and forget it with this simple Chicken Mushroom Stroganoff!! Deliciously creamy, hearty, and with so much comfort flavor. This easy dinner is perfect for a busy weeknight. It’s also dairy-free, Paleo, and Whole30 compliant! I have your two favorite words when it comes to weeknight dinner at home: Slow Cooker!! Or maybe its: Instant Pot! Regardless, I know these two gadgets are an absolute life saver and keep us busy people away from processed food, take-out, and drive thru’s. 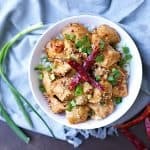 I also have chicken in the title, which I’m sure gets even more of you excited about making this easy dinner. 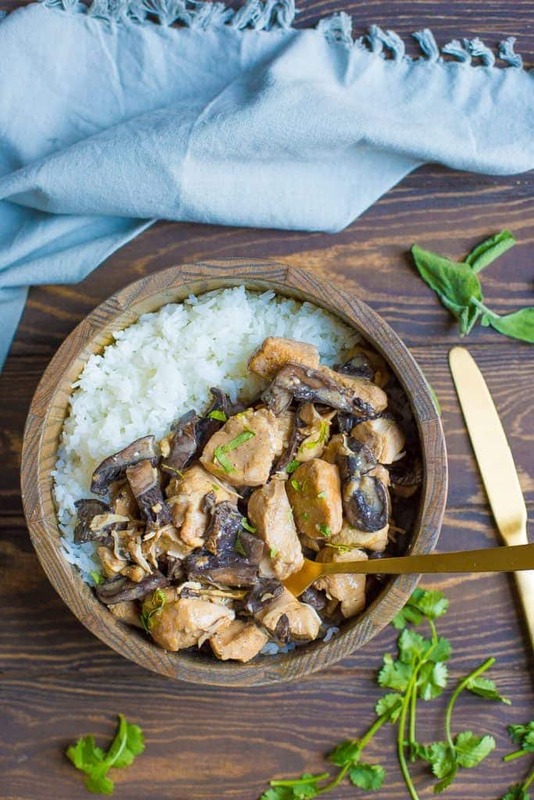 I had intentions of creating a deliciously creamy, garlic-y, portobello mushroom chicken dish in the slow cooker, but after tasting this dish, it immediately reminded me of what a Chicken Stroganoff would taste like. 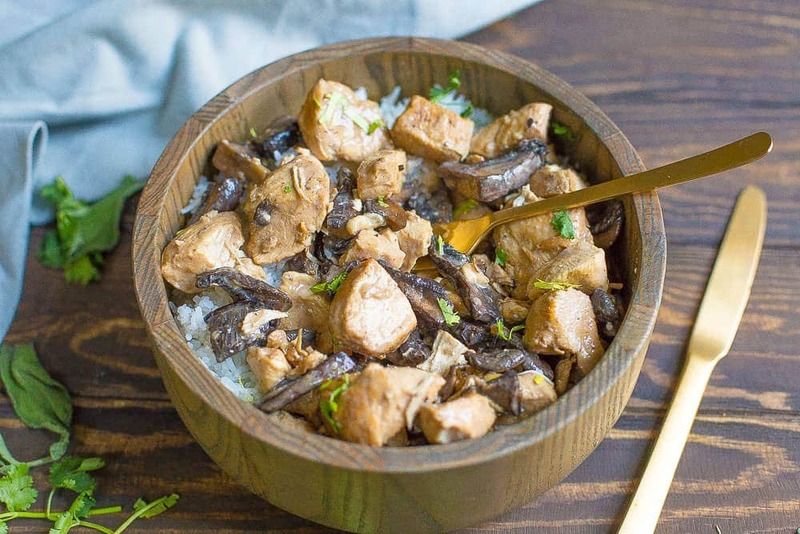 It’s nutty and earthy with a yummy blend of portobello mushrooms and garlic, but also has a nice tang and salty taste that is similar to my Beef Stroganoff (which is my husband’s favorite slow cooker meal and one of my most popular recipes!). The chicken is also coated with a tapioca (or arrowroot) starch to give it a slightly crispy texture, and helps to thicken up the sauce which is similar to a gravy. This does require a few minutes of prep before tossing everything in the slow cooker, or you can use the instant pot to saute the chicken before securing the lid. 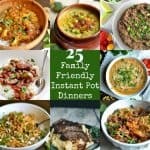 My kids love this simple dinner too! Serve over rice, cauliflower rice, pasta, or vegetable noodles. Heat up a large skillet to medium high heat. Once hot, add oil to coat the pan. In a Tupperware or plastic ziplock bag, toss chicken and arrowroot together. Shake it up so that the chicken is completely covered. Now add to the skillet. Cook for just 1-2 minutes on each side so the chicken is lightly browned (doesn't have to be cooked all the way). Now toss into your slow cooker. Place mushrooms and garlic on top. 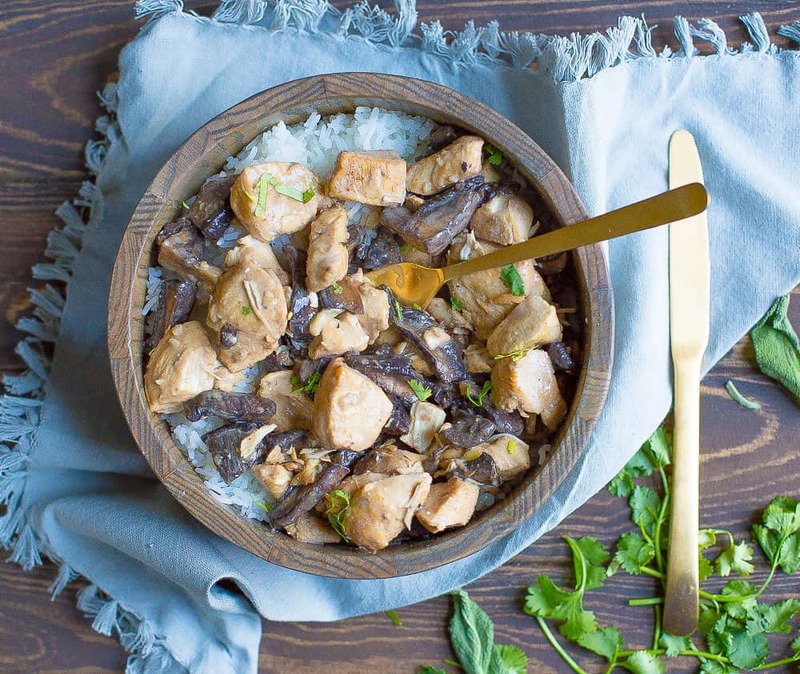 In a small bowl, mix together coconut aminos or soy sauce, vinegar, and chicken broth. Pour on top of chicken. Cover with lid and cook on low for 4 hours. Once complete, open lid. If sauce seems too thin, add another tbsp of starch to the coconut milk. Pour into the slow cooker and mix until well incorporated. Cover with lid and cook for another 15-20 minutes. Spoon on top of rice, cauliflower rice, or pasta and serve immediately. Select the saute function on your instant pot. Once hot, add oil. In a Tupperware or plastic ziplock bag, toss chicken and arrowroot together. Shake it up so that the chicken is completely covered. Now add to your Instant Pot. Saute for 1-2 minutes per side, or until slightly browned. Now toss in mushrooms and garlic. Select cancel. In a small bowl, mix together coconut aminos or soy sauce, vinegar, and chicken broth (be sure to use 3/4 cup instead of 1/2). Pour on top of chicken/mushrooms. Secure the lid. Now select the manual function, and cook on high pressure for 7 minutes. Once cooking is complete, use a natural release for 15 minutes. Release any remaining steam and open the lid. If sauce seems too thin, add another tbsp of starch to the coconut milk. Pour into the Instant Pot and mix until well incorporated. Select cancel, then the saute function. Let cook another 10 minutes until mixture is creamy. Select cancel. great recipe. very easy to follow. family loved it. Made this tonight in the instant pot and it is terrific. Thank you for sharing. I had no idea what to make with what I had in the house, and this fit the bill. I’m still learning how to use my IP so I love the help. This recipe needed something else to add depth to the flavour. It had a flat, muddy flavour as written above. The chicken was masked by mushroom and the whole dish just tasted like mushrooms. Maybe some herbs would brighten the flavour. I added 1tbsp marjoram to starch for coating chicken and then 2tsp kosher salt and 2tsp fresh ground pepper to sauce after thickening with coconut fat and extra starch. Delicious.